Incline Gallery and the non-profit arts organization Cultivative invite you to the international mail art exhibit “I dream of…”. Artists of all skill levels and ages answered Cultivative’s call for artists and created postcards that will help those in need of cheer and a smile during the holiday season. More than 250 artists from over 30 countries around the world contributed postcards so far and you can still submit your artwork until November 15. The opening is on December 5, 2014 at Incline Gallery. Incline Gallery could not agree more that Mail Art is a viral art form when they recently hosted their first Mail Art Workshop. The engagement of the local community was incredible. Over 50 people were creating their own postcards with Bianca Nandzik from Cultivative. 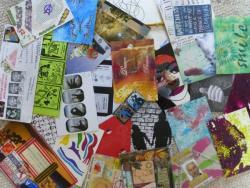 She is curating the exhibition as a member of the International Union of Mail Artists (IUOMA). An important focus of Incline Gallery is to also give emerging artists a chance to display their work professionally. The gallery is proud to feature works from the Egyptian artist Mohamed Zakaria who combined butterflies with the usage of Arabic calligraphy in his digital artwork. Another must-see in the exhibition is the series of Kristina Zimbakova from Macedonia. Her work is amazingly creative, using materials found in nature on canvas. While the most unusual piece in the exhibition is the mixed media collage including perishable materials by Pedro Bericat from Spain. After the exhibition all artworks will be send as a small gift to residents in nursing homes, orphanages and homeless shelters worldwide to make them feel a little bit less lonely during the Holiday Season. Cultivative is a non-profit organization operating worldwide by enabling people to discover, experience and explore their creative potential in arts, science and technology to evolve our culture together.